What better place to launch new products then Australia's best furniture, lighting and interior accessories fair? Australian brands and small studios took the opportunity of Denfair to roll out their new products - some exclusively for the Australian market, others like Nau, the new brand attached to Cult, with the idea of future international launches. While Australia's design scene is pretty small by international standards there was an interesting range on display from the bespoke lighting of ADesignStudio to the purposeful creation of well-priced mass produced products by Adam Cornish for Nau. Brands like Design by Them and Something Beginning With showed that Australia can be directional and fashionable while Nicholas Fuller and Alex Fitzpatrick showed that beautifully crafted pieces are still appreciated in this era of the low cost global marketplace. 'Hull' chairs by Tom Fereday & SD Element for Zenith. The 'Trace' outdoor collection by Adam Goodrum for Tait. Alex Fitzpatrick's new lighting designs for his brand ADesignStudio offer a luxurious look with exquisite handblown glass. As a shortlisted finalist in the 2016 LAMP International Lighting Award, Fitzpatrick is currently showing at LAMP 2016 in Vancouver, Canada. He will be also be showing his 'Greenway' and 'Eon' lights at Maison Object in September as winner of the Maison Objet Asia 2016 Rising Talents Award. Rhys Cooper is young Adelaide based designer who is currently an Associate at the Jam Factory under head of furniture John Goulder. Originally from Tasmania Cooper started his eponymous studio in 2016 after completing a Bachelor of Environmental Design - Furniture Design and an honours degree in Contemporary Arts - Sculpture at the University of Tasmania. Launceston. 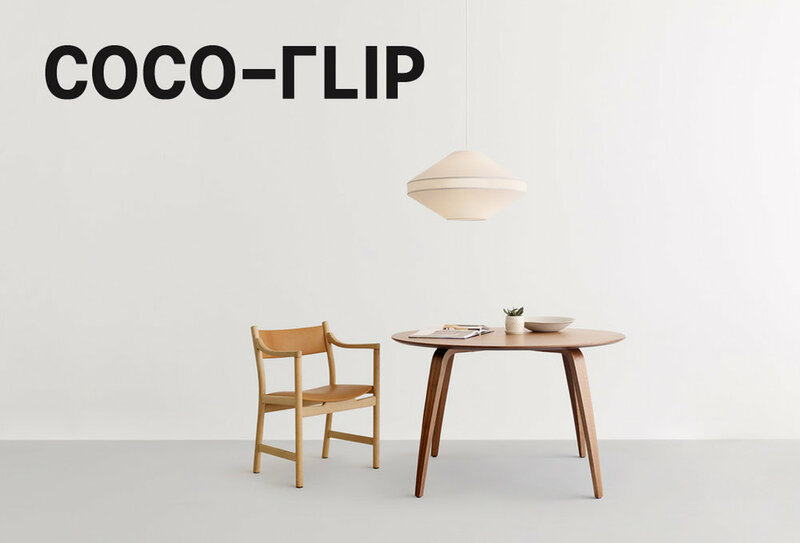 Rhys Cooper's 'Carve chair, 'Flute' side table and 'Spoke' pendant light. The table and chair are available in natural ash or stained black ash. Upholstery in various Kvadrat fabrics or leather. As mentioned in last week's post on the highlights from Denfair, Nau is a new furniture and lighting brand set up by retailer Cult as an independent arm to promote Australian design both locally and overseas. The brand is developing and manufacturing work by a group of Australian designers including Adam Cornish, Adam Goodrum, Gavin Harris, Jack Flanagan and Callum Campbell. Shown below left is Adam Cornish's 'Rev' stool and below right is Cornish's 'Frame' shelving. Below left are table and stools from Gavin Harris' Bulbo collection. To the right is the 'Bell' pendant by Adam Goodrum - both for Nau. Below left is Adam Cornish's 'Strand' chair and table which utilises multiple strands of fine steel wire to create a strong frame. The moulded seat shell is faced in oak veneer and flexes via a rubber shock mount where the seat's back meets the frame. To the right is Jack Flanagan's 'Kubrick' stool in birch plywood which explores the creation of 3-D forms using a 2-D sheet material. First seen by Design daily as part of Craft ACT's Mitchell, Fuller - Moving Forward Looking Back exhibition in November 2016, the 'Cantilever' side table by Nicholas Fuller won this year's Front / Centre Emerging Talent Award at Denfair. The table has now moved from limited edition piece to a more affordable production item and is available in oak, black stained oak and walnut. A Limited Edition (LE) version of the side table still exists with its current incarnation being in solid Maccassar Ebony or pink washed oak. Nicholas Fuller's 'Cantilever' tables have gone from limited edition pieces shown last year at Craft ACT to going into production and winning the Denfair Front / Centre Emerging Designer Award. Sydney based studio DesignByThem has released some very interesting products in recent years by some of Australia's best designers: Jon Goulder, Trent Jansen and Tom Fereday. This year it was the turn of the founders Sarah Gibson and Nick Karlovasitis to launch something new of their own and the duo presented a delicate looking wire chair called 'Piper' (shown below left) and moved into full upholstery for the first time with a sofa called 'Cabin'. The sofa uses cylinders and rectangular prisms to create a playful Jenga-like piece. The version shown at Denfair was upholstered in velvet and looked seriously luxurious. The rather abstract close-up images of the 'Bobby' and 'Piper' chairs (shown below) were all that was available at the time of posting). The 'Cabin' sofas and armchair by Sarah Gibson and Nick Karlovasitis for DesignbyThem. Photograph by Pete Daly. As seems to happen from time to time, two completely non-connected studios came up with almost identical concepts and saw each others work for the first time as the products were launched at Denfair. Imagine the disbelief at seeing a rival brand showing almost the same object as you have designed? This occurred with the 'Bobby' chair by Daniel Tucker for DesignByThem (below right) and the 'Halo' chair and barstool (shown below left) by Melbourne brand Something Beginning With. Both chairs are also available as barstools and both are available in oak. 'Halo' is designed by the brand's founders Lisa Vincitorio and Laelie Berzon and utilises a continuous arc for the back rest and back legs. The seat of the chair is also a circle making the rounded look a significant departure from the archetypal dining chair. The chair is is available in solid wood or upholstered in perforated leather. While the 'Halo' range started in timber it has also been extended to include a number of outdoor products in metal including a chair, sofa, side and coffee table. Melbourne studio Effie Design Office launched its brand Steelotto at Denfair with a small collection of chairs and benches made from (and celebrating) steel. The 'Chubby' stool can be seen below left and the 'Chubby' bench below right. The collection also included a mobile side table which boasts a pair of wheels. 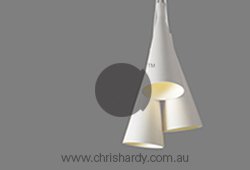 Ism Objects was founded by Celina Clarke and Simon Christopher in 1990 and has been one of Australia's most enduring lighting brands. At this year's Denfair they showed the final production version of their self inflating (and deflating when switched off) Japanese rice paper pendant lights. These were first shown as a prototype at last year's Denfair but have been developed substantially since then. The brand also launched 'Teamwork', a new pendant that features an acoustic material on the underside of its soft disc shape to reduce conversational noise reflected from table tops. While this may seem a small surface, the noise reduction effect is actually quite pronounced. In addition Ism reworked their cute 'Wink' table lamp to become a portable rechargeable light. Ism Object's new acoustic pendant light range called 'Teamwork'. The LED light uses a new acoustic material to absorb reflected sound from table tops with surprising results. Photograph by Mike Baker. As mentioned in last week's post, Zuster has launched a luxurious new collection called Embellish that features unusual details like brass studs and blown glass handles. The collection was predominantly shown in black stained oak but is also available in a number of other timbers The collection is highly symmetrical and heavily geometric as can be seen by the 'Embellish' dining table below. Zuster's new collection Embellish featuring a studded dining table and the 'Grand Buffet' with blown glass handles beyond. Designer maker Alex Earl and graphic designer Brandyn Heyser have teamed up to create an extraordinary wall sculpture / luminaire. 'Telegon' is made from solid timber (in the image below it's walnut) with a facetted appearance that the designers refer to as 'evoking lunar and alien landscapes'. The perimeter of the timber is wrapped in a LED strip that gives off a low glow to highlight the sculptural qualities of the wood work. The 'Telegon' wall lamp by Alex Earl & Brandyn Heyser - solid facetted timber with an LED ring - 700 or 1100mm in diameter. It's hard not to fall in love with the 'Arancini' floor light below left and its smaller table top cousin the 'Arancini Jnr' (below right), by Michael Chazan for Melbourne brand Moda Piera. The lights feature brass, travertine and opaline glass.